Suicide Squad is an amazing comic book story turned int a live theatrical movie. Supervillains, anti-heroes, or bad guys? As Shakespeare said, "That is the question". Okay, he wasn't referring to DC's Suicide Squad movie, but who's really checking? All we know is that Superman's dead, Batman's catching bad guys, Will Smith plays a very expensive hitman, and the Joker's got a girlfriend so crazy that she makes him look like the poster boy for the Boy Scouts. Writers David Ayer and John Ostrander do a spectacular job providing background information on each of the members of the Suicide Squad. Each character is introduced from their conception to how they became members of the Squad. The storyline presented is not overbearing in details; yet, it is indulgent enough to concentrate on each character and highlight their villainous character along with their weakness. The dialogue flows and the interactions of the characters are natural. As happens in Hollywood, good people do double duty and David Ayer is no exception to that rule, as he also directed the Suicide Squad. With an all-star cast, a great script, and an audience ripe for the picking, Ayer couldn't have had an easier job, but that doesn't take away from his accomplishment. Intertwining all the individual character sub-plots together with the main story of catching the Enchantress was flawless. In addition, many of the superhero movies and television shows incorporate a less adult theme in order to make it more appealable to families. Ayer did a remarkable job of bringing more of the adult theme into Suicide Squad while still keeping it family friendly. He also discarded the usual underlying dark tenor usually found in the DC movies by bringing more humor into the script and by the sheer choice of actors. I usually don't wait so long into a review to write about the actors but Suicide Squad would not have been a success with other actors cast. Viola Davis (How to Get Away With Murder) plays Amada Walker, the government agent who puts the Suicide Team together. Her character is steely, firm and stupidly brave in the midst of all the Squad members, but she gains Deadwood's trust through her blind faith in them. Will Smith (Independence Day; I am Legend) plays Deadwood, a well-paid hitman by night, a devoted and caring father by day and the apparent ringleader of the Suicide Squad. Jared Leto (Nocturnal Animals), with big shoes to fill, is The Joker, formerly played by Heath Ledger and Jack Nicholson. Leto brings a fresh new outlook to The Joker, and watching his compassion for his love, Harley Quinn (Margot Robbie; Legend of Tarzan), played out on the big screen is a unique perspective never really seen before. Robbie is amazing a Harley Quinn, playing both Dr. Quinn prior to her transformation to Harley and then afterwards. She brings the little girl looking for love perspective to the movie, along with a really skimpy costume and a baseball bat. The antagonist of the film is the Dr. June Moon/Enchantress, played by Cara Delevingne (Paper Towns), who is superb. However, my favorite character is El Diablo, a fire starter, who shoots fire out of his palms. Jay Hernandez (Bad Moms) brings life to El Diablo, who turns himself into the police when he kills innocent women and children. When approached by Walker, El Diablo wants no part of the Squad; he has been sitting in isolation self-reforming himself. In fact, it takes more than half-way through the movie for him to even use his pyrokinetic powers. Hernandez brings compassion to El Diablo, much like Leto brings to The Joker. El Diablo's human emotions, so much more pronounced than any of the other characters, is touching and riveting, especially when his character looks like a tattooed skeleton. If you've seen the movie in the theaters and are wondering why you should have any interest in purchasing the Blu-ray, let me tell you. First, the Blu-ray comes with the Extended Edition, which includes several additional deleted scenes and if you've never seen the theatrical version, you would never know that they were added in because the production flows so well. And, while there are a few extra Joker/Harley scenes included, the point of contention that Jared Leto, as well as fans, had about excluded scenes still holds water. Task Force X: One Team, One Mission (23:08): A look at some of the history of Suicide Squad in comics. DC Comics writer John Ostrander, as well as David Ayer, and the principal cast are included in this feature. Chasing the Real (9:37): A look at the film's special effects that features David Ayer, production designer Oliver Scholl, visual effects producer Ed Ulbrich and other contributors. Joker & Harley: "It" Couple of the Underworld (14:29): Jared Leto and David Ayer , among others, discuss reinventing the Joker, while Margot Robbie talks about getting into character as Harley Quinn. Squad Strength and Skills (9:03): This feature takes a look at the stunt sequences with the stunt coordinators Richard Norton and Guy Norris. Armed to the Teeth (11:48): Property master Don Sissons discusses the weapons and props. This Is Gonna Get Loud: The Epic Battles of Suicide Squad (10:54): The feature gives the viewer a look at what it takes to get the fights scenes done just right and capturing them on film. The Squad Declassified (4:19): A look at each member of the squad and their favorite weapons. Third, you can't get the 4K Quality in the movie theater like you can from the 4K Ultra Blu-ray version that I watched. This is only the second movie I've reviewed in 4K and my experience is no less enthralling as it was the first time. The 2160p Ultra HD Premium resolution 16x9 with and aspect of 2.4.1 is so clear and so crisp that I want to reach in and grab Harley's baseball bat and the purse she stole from the window. The audio is presented in Dolby Atmos. I don't have any special sound equipment at home, not even a sound bar, but I could hear each and every laugh from The Joker as if he were sitting beside me. Unlike a lot of other movies where the music overpowers the dialogue, or you are constantly adjusting the volume, the Dolby Atmos sound quality on the 4K Blu-ray was constant and clear. Overall, the presentation of the 4K Blu-ray was a pleasure to experience. Suicide Squad is an amazing comic book story turned movie and the director, writers, and cast really mixed the light adult humor with the younger fantasy-type movie that kids love. Overall, I can simply state that Warner Bros. knows what movies to produce and if they keep going this route, every production the Warner Bros. puts out will be a blockbuster hit. 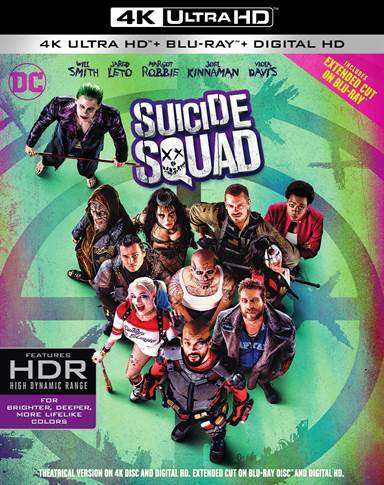 Download Suicide Squad from the iTunes Store in Digial HD. For more information about Suicide Squad visit the FlickDirect Movie Database.